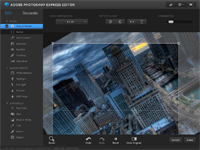 Adobe Photoshop Express is a suite of online tools for photo editing, organizing and sharing. The current version consist of five applications. Photoshop Express Editor for quick photo fixing (crop, straighten, rotate, adjust color, touch up imperfections...). Photoshop Express Style Match - a simplified online version of the Photomerge Style Match tool in Photoshop Elements 9 software, which helps you create new photography styles. Photoshop Express Organizer lets you easy keep and share of all your photos and videos. Photoshop Express Slideshows - create interactive slideshows of your albums. Photoshop Express Uploader for easily adding photos and videos in your online library, you can simply drag files onto a Photoshop.com album. With the available features of Express Editor and Express Style Match you can to familiarize without registration. Могли и больше функций добавить, но в целом, неплохо.